Region: This cricket is found throughout North America. Life cycle: This insect produces one generation each year and overwinters in the egg stage. The eggs are laid in early autumn and hatch into nymphs in the spring. 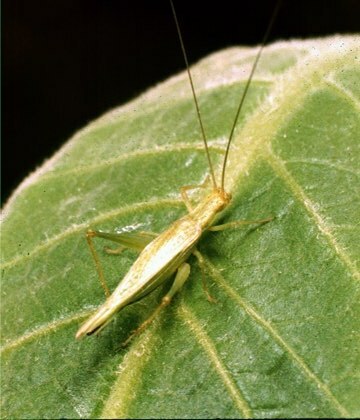 Physical Description: This 1/2 inch long cricket is pale green to white, is very slender, has long antennae, and makes a chirping noise at night. The eggs are laid in a series of tiny holes made in the bark of the host plant. Feeding characteristics: This pest will attack apple, blackberry, cherry, grape, peach, and plum plants, although, damage is usually minimal. In fact, the only serious consequence to their feeding is the possible introduction of disease through the injured area. They will also feed on small insects. Controls: Crops overgrown with ground cover are most susceptible to an infestation. Control methods are not usually necessary if the ground cover is kept to a minimum or eliminated.